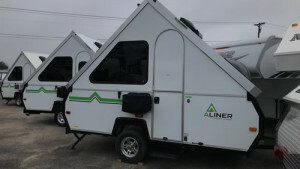 The Aliner folding trailer has been a staple in the lightweight travel trailer market for over 35 years! 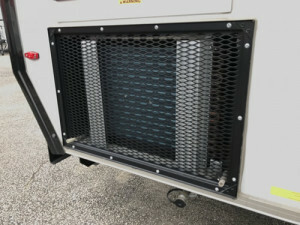 The traditional pop up camper has canvas sides and can take 30 minutes to set up. What if you could have solid side walls and a 30 second set up? And it fits in your garage? No, it’s not too good to be true, it’s an Aliner! The original Aliner was a 12 ft trailer (15 foot overall length including the tongue). Although this style has been copied, the durability and performace of the Aliner that has not been duplicated. The Performax 500 floor is lightweight and has a resin coating to stop any moisture penetration. No painted OSB flooring here! 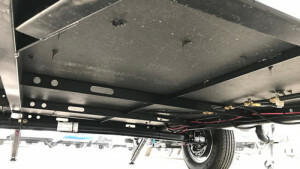 The steel frame and laminated construction give Aliners a weight that is far below any competitive products and offers more options for tow vehicles. Today, the top selling models continues to be the 12’ trailer with 3 levels of standard features. 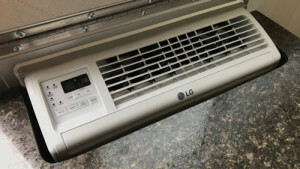 The basic, all electric Scout can have a sink, electric only refrigerator, and a 5000 BTU A/C. Because it is so basic, we have concentrated on comparing the features of the fully loaded Classic, and the slightly less optioned version, the Ranger 12. They all look the same on the outside but have different standard features as well as some variation in options. Adding dormers to one or both of the roof panels is a great way to add head room in the seating areas and make the interior feel larger. Another great feature of these dormers is the window in the front and rear dormers opens for more air flow! The Classic can have hard dormers where all sides are fiberglass panels, or soft dormers where the roof of the dormer is solid fiberglass and the sides are canvas. 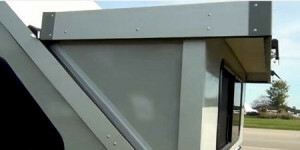 The Ranger 12, however, can only have the soft dormers. These dormers set up just like the aliner roof panels, and the camper can be used with or without opening the dormers.